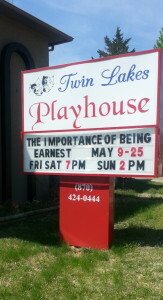 Twin Lakes Playhouse, for the last 40 years, has been bringing LIVE theatre to the Twin Lakes community. We are ever-evolving, adding new and innovative ideas to our Season, with musicals, children’s theatre, youth, teen and adult acting workshops, director and improvisation workshops, and a special addition called On the Boards Café, which showcases local talent. The playhouse is always looking for interested members to participate. There are many people needed to put on a production, including costume. hair and make-up, set building, lights and sound technicians, backstage crew, workshop leaders, directors, actors, and everything inbetween. No job is too small and all are important to the outcome of the play. Community theatre is a great outlet for both children and adults, a safe place to create and wrangle your imagination. We also award a scholarship each year to a qualified student who wishes to continue their education in some aspect of the performing arts. So, we invite you to come join the fun and rewards of community theatre.